When you think of road trip games, “I Spy” or the “License Plate Game” probably comes to mind. Forget those. The games you really want to know about are the mindgames your fellow travelers play with you. I’m talking about the torturous (“Are we there yet?”), unwinnable (“I’m bored”) diplomatic (“He hit me first”) mindgames that kids play with adults. And sometimes, that adults play with each other. Let’s take a moment to consider these road trip games, and how to win them. It is, after all, the peak of road trip season, with 64 percent of Americans planning to hit the road. Wouldn’t want you to show up at your destination already defeated. 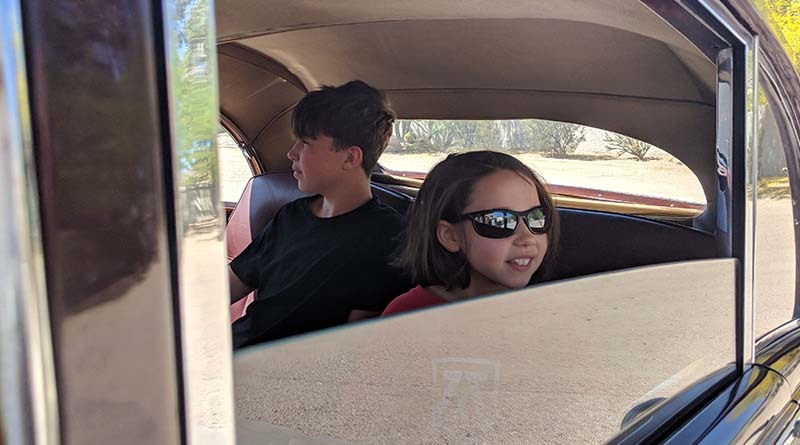 Iden and Erysse Elliott hitch a ride in a friend’s car in Phoenix, Ariz., in 2018. Are we there yet? If you travel with kids, you’ll eventually hear a voice in the back of the car, “Are we there yet?” I played it when I was a kid, and now my children play this road trip game. How do you win? Have a ready answer, beyond, “We’ll be there soon.” Also, a response like, “The more you ask, the longer it will take,” won’t work. What kind of logic is that, anyway? The only appropriate response is information. Thanks to Google Maps and Siri, we can know exactly how long a road trip will take. Defer to the electronics. Or, if you’re driving through a connection-free area like, you know, anything west of the Mississippi, hand them a map. I’m always tempted to offer a facetious response, like, “Three days,” or “I can see it from here.” I would urge you to resist. The kids always win. 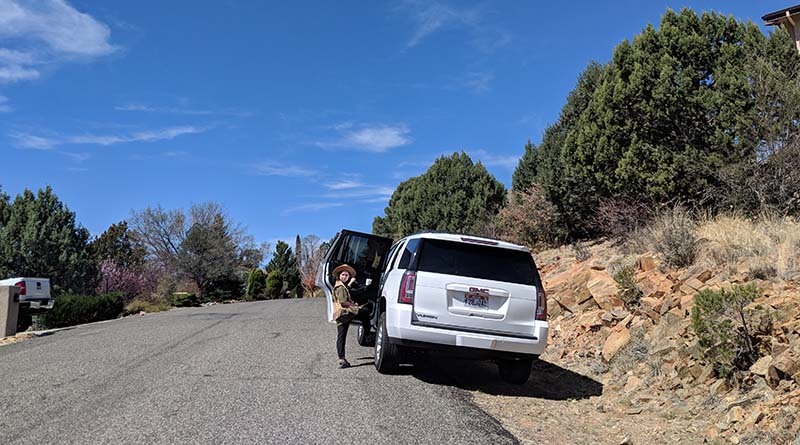 Erysse Elliott loads up her Hertz rental in Prescott, Ariz. Staying entertained on long drives isn’t easy, but it’s not impossible. What is it about this generation that they have to constantly be stimulated by video games, movies, and other glittery objects? Was I like this when I was a kid? These are rhetorical questions, of course. Still, it is only a matter of time before the “I’m bored” game gets played. This escalation is part of the game. They know you know that they’re bored, but more to the point, they know there’s nothing you can do about it. Maybe their iPhone ran out of battery. Maybe they just ran out of anime episodes to watch. Or maybe, just maybe, they’re playing this game because they love watching you get frustrated. I remember driving through South Dakota, one of the most desolate places in the world, when my 11-year-old daughter decided to play the “I’m bored” game. Fortunately, I came prepared. You have to be prepared or you will endure hours of “I’m bored!” agony, like the drip-drip-drip of water torture. My advice? Bring reading material, a spare device loaded with educational software, or — here’s a novel idea — try talking to your kids. Children sometimes like being talked to. Not always, but sometimes. The strategy works with adults, too. You might think you’ve said everything you can to the person sitting next to you, but try picking up a copy of Gregory Stock’s “The Book Of Questions” and you’ll soon find you are far from done. 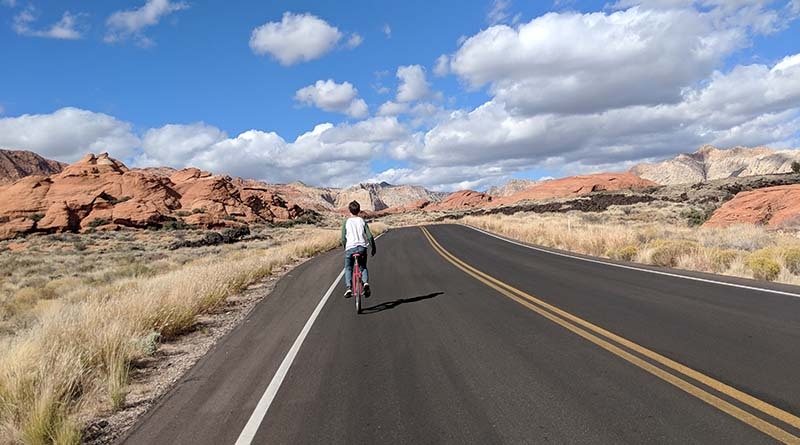 Iden Elliott rides his unicycle in Snow Canyon, Utah. When passengers start to fight, you have to break them apart and give them some distance. That’s exactly what they want you to say. Because now it’s not just two people fighting. Now the driver, or another adult, is going to get involved. The threats just make their little hearts beat faster. Here comes the fun! Here’s a tip from someone who has had to fend off this nonsense alone, as a single dad. Do pull the car over, but before the fight starts. Buy a ball, a frisbee, a unicycle, and find a rest stop. Take an extended break and let them run wild outdoors. That way, when they get back into the car, they’ll be too tired to fight. You have to understand that whether your fellow passengers express boredom, frustration, or anger, it’s all part of the same game. Now that you know they’re going to play these road trip games with you, and now that you know how to win, I promise a smoother drive. You’ll get there. Are we there yet?